In lieu of a budget resolution, the House Budget Committee has put forward a bill to increase discretionary spending caps by $358 billion over the next two years. Not only would this increase be twice as expensive as eliminating the discretionary sequester and bring base discretionary spending to record levels (on an inflation-adjusted basis), but it would expand deficits by roughly $2 trillion over the next decade. After a 16 percent spending increase over the past two years, current law calls for a 10 percent drop in discretionary spending between 2019 and 2020. The Investing for the People Act of 2019 would instead increase spending by another 7 percent over the next two years, at a cost of $177 billion in 2020 and $181 billion in 2021 (this excludes adjustments for Census funding and IRS enforcement). This plan would lift discretionary spending to record levels on an inflation-adjusted basis, roughly in line with the 2010 level that both parties considered too high. 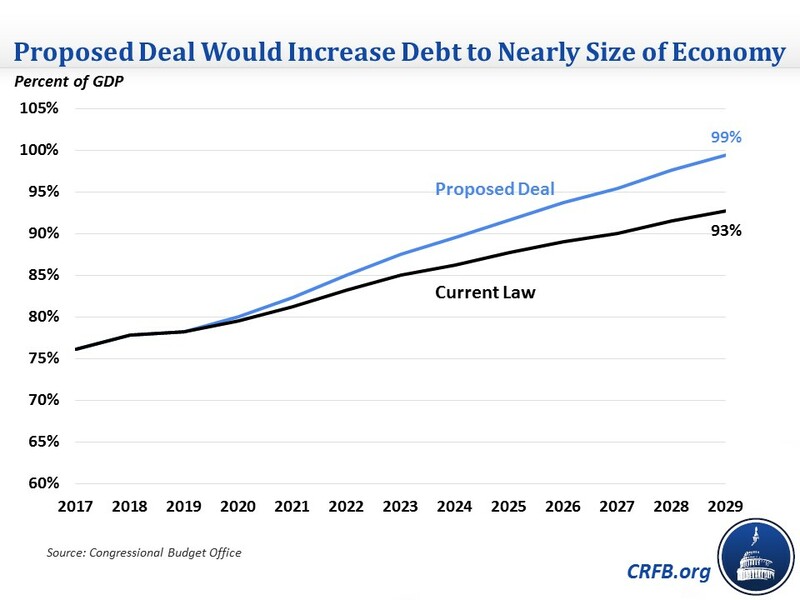 Because current law caps expire after 2021, this spending deal would actually increase projected deficits by far more than the $358 billion sticker price. Under current scoring convention, uncapped spending is assumed to continue growing with inflation. This cap deal would thus increase spending by roughly $2 trillion over the next decade. Over 10 years, the budget deal would specifically increase base discretionary budget authority by $1.98 trillion, discretionary outlays by roughly $1.8 trillion (depending on how the funds are appropriated), and total spending – inclusive of interest – by $2.1 trillion. As a result of this new spending, deficits will reach $1 trillion next year and $1.6 trillion by 2029. Debt as a share of GDP would rise from 78 percent of GDP this year to 99 percent by 2029, compared to 93 percent under current law. Note that these estimates exclude the effects of adjustments for the Census, the IRS, and Overseas Contingency Operations. Especially concerning is that the proposed legislation is being offered instead of a budget resolution, so this spending is not being considered in the larger fiscal picture. A budget resolution typically sets discretionary spending levels for the coming year, but it also includes information about all spending and revenue for at least the next five years, putting decisions about discretionary spending in a larger context. This would be the first non-election year in which the House has not passed a budget. Lawmakers should certainly not enact this kind of deal unless they are willing to offer substantial offsets. A repeat of last year's unoffset spending deal would be extremely damaging to the country's budget outlook, as would any attempt to circumvent caps by reclassifying ordinary spending as war funding. A better path would be to set more affordable caps that are offset with real savings from mandatory programs and revenue increases. One example is the Senate Budget Committee's proposal, which didn't identify specific spending levels but did call for increases to be fully offset.